The RAM U-Bolt Handlebar Mount has been available for many years and is mainly marketed to the motorcycle crowd. The mount forms the basis for custom configurations when paired with RAM’s huge selection of custom cradles as well as their universal X-Grip holders for phones and tablets (you can read a detailed article on X-Grip cradles here). This mount is constructed of powder coated marine grade metal. Like most RAM Mounts, this is built on a ball and socket design with shock absorbing technology. The mount has the ability to pivot and swivel at both the base and the tip. The shock absorbing technology lies in the rubber ball which is sandwiched between the metal arms of the extension. This provides an extraordinarily solid mount as can be evidenced in this Youtube Video shot using a similar mount with a camera adapter added to it. There are three major components to this mount: the u-bolt base, 3″ metal arm and mounting diamond. All three of these components are available individually if you ever need to purchase a replacement. The u-bolt base has a zinc coated u-bolt which fits handlebar diameters of up to 1.25 inches. RAM supplies a plastic adapter which can be optionally placed between the u-bolt and handlebar. This adapter will prevent marring of your chrome handlebar and can be used for smaller diameter bars all the way down to .50 inches. For bars that are 1.25 inches, you can use a thick rubber band to prevent any marring, but that’s optional and not included. The u-bolt is secured with a set of lock nuts that take up less than an inch in terms of handlebar real estate. Use a wrench or pair of pliers to tighten the mount. This isn’t one of those thumbscrew varieties. This is a heavy-duty mount not meant to be easily removed on a repetitive basis. This mount features the standard RAM 3″ metal arm. The purpose of the arm is to connect the u-bolt base to the mounting diamond (more on that in a bit). The mounting arm has a socket at each end where the rubber ball from the u-bolt base and the rubber ball from the mounting diamond will insert. A knob is found in the middle of the arm which loosens and tightens the arm onto the balls from the mounting diamond and the u-bolt base. The knob can also be loosened when you want to adjust the angle of the device (only do this when parked). The mounting diamond is the last component that is included with this mount. This component features two holes which adhere to the industry standard AMPS pattern in terms of spacing. This part is typically attached to one of RAM’s custom cradles. Each cradle comes furnished with a set of lock nuts and screws to attach it to the cradle. This part can be interchanged with other components such as the RAM X-Grip cradle for smartphones so in essence, this mounting combination can form the basis for multiple solutions. Notice the photo that accompanies this article. 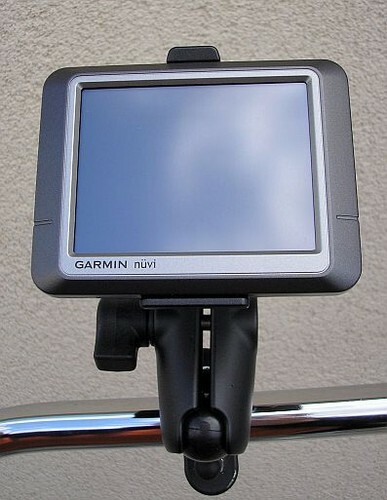 That’s the RAM u-bolt handlebar mount attached to a RAM custom cradle for a Garmin Nuvi. You can see the knob on the arm just beneath the bottom of the cradle. The handlebar in this case is an inch diameter. Removal of your device is simple. Just turn the tightening knob and remove the mounting diamond with cradle or X-Grip then tighten the knob just leaving the mounting base and arm. We have been surprised what some have done with mounts over the years and can add as a side note, never use anything such as Lock-Tite on these bolts for a tighter grip. This chemical will completely eat away at plastic including the plastic in your RAM cradle. This advice on Lock-Tite applies to almost any mount you place on a bike. Avoid using it. The RAM U-Bolt Handlebar Mount is an extremely well made mount that will last for a long time. It is easy to install and simple to adjust. RAM provides a lifetime warranty on this mount which is administered by the manufacturer.